James Wan was able to throw an Annabelle Easter Egg into Aquaman. Wan is still closely associated with the supernatural horror genre, but his latest project might be the one that breaks him further into the mainstream. Early reactions to Aquaman have been positive, with many commenting on Wan's unique vision for the underwater superhero movie. Even with the bright colors, there is a tinge of darkness to everything, including that creepy Annabelle doll from The Conjuring franchise. There are minor SPOILERS for Aquaman below, so read ahead at your own risk. Near the beginning of Aquaman, Arthur Curry is led on to Mera's ship to start a mission. While they are getting on the ship, the Annabelle doll can be seen at the bottom of the ocean, and it's very brief, which means that a heads-up is a good thing so that you can look out for it. James Wan was recently asked about the creepy cameo and he played coy. He had this to say. "I don't know what you are referring to. (laughs) I have no idea what Easter Egg you are referencing here, if it's an Easter egg... Maybe Patrick Wilson is really Ed Warren pretending to be King Orm? What can I say? I'd like to see that film, how about that?" 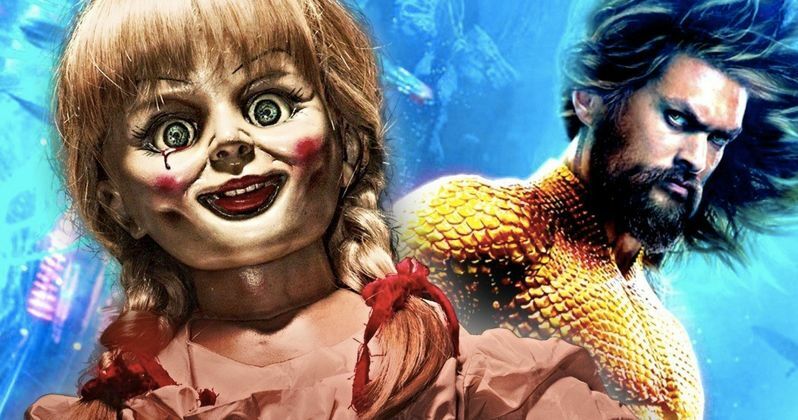 When asked about the Annabelle doll cameo in Aquaman, King Orm actor Patrick Wilson claimed that he didn't know about it, but added that he wasn't surprised that James Wan would include her. Wilson also had a good laugh about Wan's idea for an Aquaman and The Conjuring spin-off that he jokingly put out there. While that's all fun, Wan was clearly joking when he made those comments and is not about to really make that movie. In a separate recent interview, James Wan was asked about other DC properties he might want to tackle in the future. The director said that he would love to do a version of Batman, but in the horror genre. It was a hypothetical question that Wan delivered a hypothetical answer to, but it nevertheless turned into stories that Wan was making a horror version of the Caped Crusader. Wan later revealed on social media that he is not making that movie and that he really does not want to make it. So don't expect The Conjuring and Aquaman spin-off to hit theaters or a horror version of Batman from James Wan. Instead, keep an eye on the box office when Arthur Curry's standalone movie hits theaters to see if Wan and crew will get the chance to make a sequel. The movie is already projecting to do pretty well, and if the positive word on the street keeps spreading, we could easily see Jason Momoa team up with Wan again for another adventure. Don't forget to look for Annabelle when going to see Aquaman in theaters. This news was first reported by CinemaBlend.